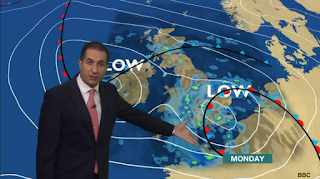 Home / Archive / BBC Weather changes: storm in a teacup? BBC Weather changes: storm in a teacup? COMMENT | The BBC is ditching the Met Office as supplier of its weather forecasts, prompting a furious backlash in the Sunday papers, with the remaining companies in the run to win the new BBC Weather contract critised for being "foreign." This has led to reports that UK jobs will be lost and that foreigners who don't know the fickle nature of the British weather will end up providing the weather forecasts on the BBC. The Mail on Sunday / MailOnline, from which most original reports on the subject were based, says that the bidders thought to be remaining in the process are "thought to be Metra, an offshoot of the New Zealand national forecasting service and Meteo, a collaboration between the Press Association, based in the UK, and the Dutch national weather service." A very quick search reveals that the Press Association sold its weather division - MeteoGroup - to give its full name - at the end of 2013. Media reports of the sale at the time referred to the company as "Meteo" (here). MeteoGroup had been originally founded in the Netherlands by a Dutch weather presenter. The company in its current form is headquatered in the UK, and already supplies the weather for Channel 4 and several newspaper groups. MeteoGroup also operates the weathercast.co.uk and raintoday.co.uk websites. Not as foreign as the headlines boast. The other contender named by the Mail on Sunday, Metra, may not be a well-known name in the UK, but it's the company that supplies the weather graphics that appear on BBC Weather forecasts (pictured above). The BBC has stressed that Met Office weather warnings will continue to feature in the bulletins. The broadcaster refused to discuss the ongoing bidding process or the names of the companies still in the running for the new weather contract, which will come into force next year. But in an era when millions trust their default smartphone weather app for the forecast, despite its data being supplied by international weather companies such as AccuWeather, is this a misinformed storm in a teacup? Incidentally, MailOnline does not use the Met Office for its forecasts either. Its forecasts are supplied by Netweather. It doesn't matter who they pick as they are all usually wrong in any case. They'd be the first to complain if the BBC renewed their deal with the Met Office when cheaper alternatives were on the table.